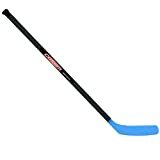 The Franklin Sports NHL 1090 Hockey Stick is our best hockey stick, which is easy to grip so it is made well for the novice players as well as for street hockey. It has a rigid ABS blade that won’t easily break down so it also makes a great backyard stick for practice. Made with thick wood, the shaft and blade construction is fused together for durability. Our step-up pick is the Campus Shooter 2017 Salming Shooter 30 and hockey stick is great for youth hockey players and you can choose between left and right hand for which dominant hand you have. In addition to that, to make the hockey stick really durable, the composite shaft has been coated for weather protection. The budget pick is the Mylec Eclipse Jet Flo Stick and its solid wood shaft is very durable and its Jet Flo blade can be replaced when worn out so you can keep it durable. It has two screws keep the two-piece design as secure as possible. In addition to that, the hockey stick is good for practice and actual games and what’s more, it’s affordable. A hockey stick can either be of two things: ice hockey sticks or field hockey sticks, but the most common way to describe the term is with ice hockey, since it is somewhat of a popular sport and the first thing that comes to mind for most people with the word “hockey”. Hockey sticks are either L-shaped or J-shaped depending on the type of hockey, and all have different heights and weight standards. There are also various aspects, such as the lie angle, the heel, the toe and many other parts of a hockey stick that can influence your playing style. Most hockey sticks are either made of wood or some composite material, such as aluminum, titanium, graphite, carbon fiber, fiberglass and many others. The materials can dictate the durability and the ease of handling of the hockey stick, which can also come in either smooth or textured grip. Stick material: a hockey stick can be either made of pure wood or composite material such as fiberglass. It can also be made out of aluminum, graphite, titanium, carbon fiber and many other materials. Age group: you should consider who will use the hockey stick for a hockey game. It can be for juniors, for adults, for youth level and other levels. Length: the length of the hockey stick can be from 26 to 54 inches and above. You should consider the height of the person to make it easier for him or her to handle the hockey stick. Having a good length is important so that you feel comfortable with the hockey stick, and kids should have one that they will not easily outgrow over the course of time. Weight: having a heavy hockey stick is ideal for power shots, but beginners should stick to a lighter hockey stick if they want to make quick passes and better handling. Right-handed or left-handed: even hockey sticks have configurations for both left and right handed people, so make sure you choose carefully as to who will play the hockey stick. Ice hockey or field hockey: it can be confusing to just say “hockey stick” when you don’t know if it is for ice or field hockey, so you need to specify first. In this review, we will tackle both hockey sticks for ice hockey and field hockey, anyway. Our best hockey stick is the Franklin Sports NHL 1090 Hockey Stick, which has left and right hand configurations for different player. It is easy to get started with this hockey stick and it has a light and nice curve for beginners. It is made with multi-ply poplar and birch shaft so it is quite durable. This birch shaft is unlike any other hockey stick material because it helps keep a proper form while being resilient. It can be a driveway hockey stick as well and is a good stick for young kids. The hockey stick is made with a vinyl graphic wrap with a full coverage for keeping it as durable as possible for more games to come. The hockey stick is also designed for concrete games. For those who want or need a hockey stick that can take a beating, this is a good choice, either for practice or for real games. You can be able to play on concrete with this hockey stick that measures 40 inches long. The Franklin Sports NHL 1090 Hockey Stick may have a con but not a deal breaker, such as the fact that it may not be as powerful or durable as higher priced sticks, but it is great for junior and youth level, and some professional level as well. Our step-up pick for the best hockey stick is the Campus Shooter 2017 Salming Shooter 30, which has a circular grip handle shape. It has two sizes: 37 and 40 inches length options so you can choose depending on your height and preferences. The height range of this hockey stick is just right for most people, such as youth and junior levels as well as some senior players. As an entry level stick, the hockey stick will be favored by those who are starting out on hockey as well as those who are in the junior or youth level for hockey. In addition to that, some adult hockey players can find this hockey stick good for practice, ease of control and practicing their shots. If you want a hockey stick to practice your skills with and not worry about its durability then this is a good hockey stick for you. In addition to that, the hockey stick also works great for floor ball, both in practice and actual games. It can be a practice basement or driveway stick as well. Our budget pick for the best hockey stick is the Mylec Eclipse Jet Flo Stick, which has both left and right hand orientations for you to choose from and is currently available in 43, 48 and 53 inches lengths. It has a 2-piece design for easy assembly and take down when not in use, especially for traveling players. Ideal for children and for youth, the hockey stick is durably made that there is no paint to peel off because of its wood design. You can have lots of fun playing with your kids while practice or during real games as this hockey stick is designed mostly for children. On the other hand, the hockey stick is a stick that is aimed for both kids and adults so it is a great buy. It is one of the most durable sticks out there at a low price and can potentially replace a worn-out stick. The hockey stick can handle any abuse by kids and teens alike and is ideal for street hockey as well. The Mylec Pee Wee Total Hockey Stick can be either right or left orientation depending on the dominant hand and is made for ice hockey players. In addition to that, it can also be used for street hockey as well. Moreover, the blades are made of ABS material so they are lightweight and easy to control. If you are just starting out with hockey then this hockey stick is good and it has a right curve for beginners to use. It handles well, especially for novice and intermediate players. What’s more, it is ideal for kids or those with smaller hands. The stick has a very firm feel overall and it can be a street-worthy stick to have. You can even use this stick for toddlers or for playing your first game if you are new to hockey. It measures a total of 46 inches in length so it is just right for those who have medium height, such as those in the youth or junior league or some adults as well. 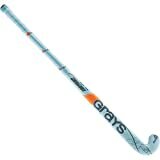 The Grays Surf 500 Field Hockey Stick is made of 50 percent fiberglass and is used for field hockey. This hockey stick is a composite stick so it is not just durable but also easy to control. It is junior sized at 19 to 20 ounces so it is great for kids and teens as well as a field hockey stick. It is made of wood construction as well as a hockey stick that is composite and ideal for beginners. It is made out of 35 percent carbon material so it is pretty sturdy and ideal for the younger players out there. It is easy to get a good grip with this hockey stick and you can select sizes from 24 to 36 inches. The hockey stick has 15 percent of Kevlar material so it is thinner and lighter for kids while being sturdy as well as you can use it for a whole season. The hockey stick is also ideal if you are absolutely new to field hockey. The Cramer Cosom Junior Plastic Hockey Stick measures 43 inches long and is ideal for adults as well as junior players. It is made out of durable blades so you can play roller hockey as well without getting hindrance along the way. It is also great for ice hockey as a hockey stick and is made out of high-density polyethylene blade. It is also applicable for street hockey and can be used either on indoors or outdoors in any playing area. You can also use it for floor hockey and it will not go wrong as to ruin the playing area indoors. The whole hockey stick weighs 13 ounces so it is not difficult to use in a hockey team or while practice. It is also ideal for youth (high school players) and it is made with a light but durable ABS plastic shaft. Additionally, it does not damage the flooring when you use it for floor hockey. The hockey stick also ensures less bending over due to its just-right height and it is also great for basement hockey games. 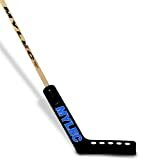 The Mylec Air Flo Goalie Stick Unisex is a great hockey stick for a goalie, which 48 inches long. It has two screws to keep it together and its sturdy shaft is made of high quality wood. The two-piece design of this stick makes it easy to carry and the blade is made for goalies as well. This hockey stick has a unisex design makes it ideal for both boys and girls. In addition to that, you can use it for either hand. The hockey stick works perfect for the streets for street hockey and it can take a beating for many practices. If you are looking for something more durable then this is a good hockey stick to have. It is also a youth stick for youth players as well as juniors. It is also good for a kid to play with and practice for their street hockey outside or even ice hockey. The hockey stick allows your kids to play hockey in the basement. The Frontier 5000 Senior Hockey Stick is ideal for ice and street play and it is made of a birch shaft which has a 14-ply construction. It is great for your outside hockey needs and has a durable design. The shaft and blade has been greatly packed together and it has a solid build for long term use. Measuring 59 inches long, the hockey stick is totally great for senior players as well. It is ideal for both left and right-handed due to the two versions of the stick being available. In addition to that, the ABS material for the blade makes it less in weight for better handling. What’s more, you can get improved slap shots as well and the overlay of fiberglass makes it stronger. 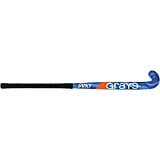 The GRAYS 350I INDOOR WOOD STICK is a great indoor hockey stick that you can use for indoor games. It has 32 to 37 inches in length choices so you can choose depending on your height and handling style. Its dual traction grip design is ideal for those who sweat a lot and often so that you can forget about slipping your hands when you are handling the hockey stick to keep it stable for any shot or pass. In addition to that, there is a drag flicking capability that you can harness with the hockey stick. It has a standard head surface but with a maxi toe so it is ideal for those who need a maxi toe stick for their needs of powerful shots while retaining the best kind of control possible. Having a medium weight rating, the hockey stick is ideal for the mid field position or those who frequently shift their playing style from one to the other. Moreover, the super stiff power rating makes this hockey stick quite a challenge for most hockey players, which is needed in indoor hockey as well as field hockey as well. In addition to that, the hockey stick has a lot of power and durability to match with other and the reinforced with fiberglass as a wood composite indoor hockey stick. If you want a good hockey stick for your indoor playing ground then this is a good choice. The Adidas TX24 Carbon Field Hockey Stick is our ideal hockey stick that is made with 90 percent carbon and other composite materials to make it lightweight but also durable. Additionally, it has a grip tape made with polyurethane for added grip so that you can control each shot that you can make with this hockey stick. This is important so that you don’t lose sight of the ball during field hockey. Likewise, the hockey stick has a touch compound to keep the ball under control so you can definitely make use of it if you want to keep passes. You also get the optimal power and control that you want because of the ball handling that is met with the 3D head shape, unlike in other hockey sticks out there. In addition to that, the carbon plate makes it ideal for those who want a stiff hockey stick. 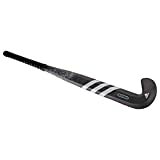 Furthermore, the hockey stick has a sleek black design for field hockey as well, like our other picks for field hockey. Other hockey sticks were too flimsy in terms of material and the grip was not really stable so it can be hard for players to control the stick at all times. In choosing a hockey stick, whether it is for ice or field hockey, it should be reliable, easy to control and durable enough for longer game durations. Q: What materials can make up a hockey stick’s shaft? A hockey stick is usually made out of wood, which is the common kind of stick you’ll see in most hockey games, especially for kids. The wood is usually dried and then cut to make it more durable. The end of the stick will have a joint using an ash block and then cured after going through a hydraulic press. It goes through a sanding process, added with graphics and then a gloss varnish to seal it off for durability. Another kind of hockey stick is aluminum. These shafts start off as sheets of aluminum and then packed together to form a thick layer to make the shaft. A heating process helps to cut and shape it to the desired length and size, with a final heating of up to 600 degrees Fahrenheit. Aluminum shafts can be colored with paint or even anodized for rust-free capabilities. A composite material shaft can also be a great hockey stick to consider. They are usually a mix of fiberglass, graphite and some other material to make it stronger. Composite shafts are derived from synthetic materials and are layered together and combined with a hydraulic press. Vacuum pressure is then added to mold it better. A bladder is inflated in the middle to mold the shape of the shaft. Finishing the composite shaft works like the aluminum one. Q: How is ice hockey different with field hockey? Q: How are hockey sticks of the two hockey games different from each other? In ice hockey, the stick is shaped like a letter L. An ice hockey stick allows you to hit with both of the sides of the stick, thereby making it more effective. Its hitting part is straight and flat. In field hockey, the stick is shaped like a letter J. Field hockey sticks are only capable of hitting the ball with just one side. The top of the stick has a curved design compared to the ice hockey’s straight one. Q: What can composite hockey sticks be made of? Graphite is one of the most popular types of hockey sticks that are composite because they are light and durable. However, they can be a little bit on the expensive compared to fiberglass, aluminum or wood. Nonetheless, they are a cheaper option compared to Kevlar and titanium. Fiberglass is also a favorite among composite hockey sticks due to its ease of manufacturing, thereby decreasing the price. Fiberglass is the cheapest of all composite sticks but can be a bit heavy depending on how they were made. Aluminum is also considered as a composite material, when you put it in another way, since it can be merged with wood shafts. Aluminum composites have been around for a long time, and this hockey stick type is the best for durability, although it can be heavier than graphite and Kevlar. The Kevlar type of hockey stick that is composite is potentially the strongest but also currently the most expensive. It is, however, a great stick to have if you want to go for a super lightweight feel. Titanium is also a hockey stick composite material, although it is mostly not combined with other materials and sits on its own, making it much more durable than Kevlar. It is also pricier, nonetheless, and can be hard to find. Q: What is the toe on a hockey stick and what does it do? The maxi is the largest hockey stick toe and is ideal for power strikes. You will find this kind of toe in most hockey sticks out there due to being a common one due to the larger and wider surface area. The midi is the medium sized hockey stick toe and is ideal for receiving and shooting as well as flicking. If you’re a beginner to hockey, the midi toe is a good hockey stick toe for you. Moreover, it can also work best for those with a middle field position. The shorti is the shortest hockey stick toe and is ideal for control of the ball or puck. For those who need a lot of maneuverability and speed, you can count on a shorti toed hockey stick for your needs in a game or in a practice. Q: How do I choose the right stick length for my hockey stick? Make sure that your stick feels comfortable to use, regardless of length. It should not feel too awkward to use in general. When swinging, it should allow you to control the head of the stick instead of the stick controlling your hands. In this way, you get better control of the shot in a game. If you do feel your stick getting in the way of your other body parts then it is potentially a stick that is too long for you. Moreover, if you tend to have back aches due to having to slouch while holding your hockey stick then it is probably too short for you. Q: What is the appropriate hockey stick weight for my needs? The right stick weight will depend on your strength. If you are just a beginner or don’t have enough strength to move a hockey stick around or have difficulty in making precise hits, you can go for a light or extra light (XL) sized hockey stick. Basically, if you don’t know what to choose, it’s safer to go with the light option so you don’t mess up your hockey game! You should be able to determine the right weight as well if you consider your playing style. Heavier hockey sticks may be preferred for those who want to do power shots while those who require a lot of control and precision can go for a lighter stick, such as a defender. The playing position can also influence what hockey stick weight you should go with. If you’re a defender, you’ll most likely need a heavier stick if you want power shots but a lighter stick if you want control. Forwards will most likely do the same but midfielders can go for the middle weight ones or vary depending on their personal preferences. Q: What is the flex of the hockey stick and why is it important? A: The flex of the hockey stick determines how stiff it is and how much force it is able to take. It is also called the flexibility of the hockey stick. During any game of hockey, you will need a lot of resistance when it comes down to using the stick and this is why you need to choose the flex carefully. Likewise, you should also consider a flexible stick that is not too stiff for easier playing. Q: What are the different flex options for a hockey stick depending on my skill level? Playing styles can get affected because a person who uses a difficult flex can make it harder to accurately shoot or hit a puck for the goal. Shooting techniques can also be affected, since the flex is all about shooting. Depending on the flex option that you pick, it can be too easy or too hard to control the puck’s direction and power. Q: What is the lie on a hockey stick and why is it important? How do I choose? Lower lie hockey sticks are great for those with a need for a longer stick, since it makes it easier to use, especially for body leaning. Higher lie hockey sticks, on the other hand, are ideal for those with a need for a shorter stick, which makes it ideal for those who mostly play upright. Q: What is the curve size of a hockey stick? Q: What is the kick point and why is it important? Higher kick points are ideal for power shots to get past the goalie. It is ideal if you really need to score and the goalie is someone very hard to get past on. Lower kick points, on the other hand, are ideal for those who need to pass the puck or ball quicker with a better release. This is ideal for beginners and also great for speed plays. No matter which kick point value you choose, you should consider your playing style first. If you’re more of a power shooter, go with the higher kick point. Otherwise, go with the lower one if you’re more of a passer in the team. Q: What is the grip of the hockey stick and why does it matter? Grip hockey sticks are great for those players who sweat a lot. If you tend to hav sweaty hands and they interfere with your play, you can go for grip hockey sticks. They have a sticky surface that is textured, making it easier for you to grip. The only downside is to grip hockey sticks is that they don’t work well unless your hands are wet, which can impact the movement of the stick. Non-grip hockey sticks, on the other hand, are ideal for those players who want to easily move the stick’s shaft to perform actions such as shooting, passing and general stick handling. Of course, the downside is that you can’t really use them effectively in the rain or when you sweat a lot, since they have a smooth surface. Nonetheless it’s a solution that is meant for stick maneuverability. Q: Which hockey position is best for which weight of hockey stick? A: A position in hockey can have a different need for a stick weight so you need to consider the weight depending on your hockey position. While we discussed the weights earlier, here is a more in-depth chart about different field positions in hockey and the recommended hockey stick weight for them. Q: How many sticks should a player own in playing hockey? A: When playing hockey , you should have at least two sticks available so you can use the one that is appropriate for your situation. This lets you switch styles depending on the needs and also helps you to be more versatile in the game. For example, you can have two sticks with different lies, different shaft materials, different weights and so much more. These differences in stick values and qualities can have an impact to your overall game, even if you only hold one position. Midfielders will need to have two or three sticks because they should be versatile and ready for anything that can happen in the game. Q: What is the right way to hold the hockey stick for a beginner? First, keep the back hand in your front and not on your back. This makes it easier to move the stick around the course as you play hockey, and it gives you more range of motion in the process. When aiming the stick’s blade, make sure you curve a little bit for the puck so that you can get more grip and control over it and not let the other team get ahead of your moves at all. Practice and practice! Controlling the puck is not really an easy task if you are a beginner. Learning to skate is one thing but learning to control the puck itself is another, so make sure you practice, since you will be battling against a crowd of hockey players. You can also measure your reach during practice. This helps to know how much distance can you reach for the puck. You can expand your reach better if you practice more, which is essential in winning a hockey game. Q: How do I make a better shot in hockey? Put all of your strength or weight to your shot. This makes it easier to shoot a powerful shot to get past the goalie. You should be able to “pull” the puck when you want to make a powerful shot, using the side of your body. Having a good hockey stick is also a decisive factor. As we mentioned in the questions above, choosing the right hockey stick is beneficial for scoring more goals on ice. It should have the right height, lie, weight, toe, curve and many other factors to keep it just fine for you to use, control and maneuver in a game. To make really precise shots that probably won’t miss, you should use the toe to make your shot, instead of the stick heel. Toe shots are the best for adding more power and distance to your puck. In addition to that, slap shots work the same because the toe adds a lot of flex and power to your shot. You should also be able to watch the goalie’s moves and get the timing right to make a shot. It takes a lot of practice to get the shot past the goalie and with a lot of focus, determination and careful watching, you can get your puck past the goalie in no time. A good hockey blade can also keep the puck as stable as possible when you are moving it across the ice. Therefore, stick selection still plays a role here, but it is more of your skill on handling the puck to make the perfect shot. Q: How do students and young hockey players pick the right stick for them? A: Youngsters can still grow taller, thus hockey stick height should respond to this factor. If you’re a student or young player at hockey, you should pick a hockey stick that will not get too short too fast, since you still have room to grow anyway. Much like buying shoes, go a size up or more so that when the season or time comes, it won’t be too short for you to use. Q: In field hockey, what three skills should be mastered with stick handling? The ability to handle the stick better is an important skill. You should be able to keep your opponent to the sides and wait for the right opportunity to make a pass or shot so as not to lose your puck or make a bad shot. The ability to take down or eliminate opponents is important in field hockey, much like in ice hockey, since both hockey sports are very physical much like in basketball, except that field hockey is done in sunny weather and on a field. You should be able to possess the ball and keep it that way until you are ready to pass. This is a basic skill in hockey and you should practice it to keep the other team from getting the ball. Q: What does power play mean in ice hockey? A: The term power play in ice hockey simply means that one team has penalties or disqualifications and thus, the other team has more players to play the game. It is simply a slang or term to call this advantageous moment in ice hockey. In the long run, the Franklin Sports NHL 1090 Hockey Stick is our best hockey stick due to its birch shaft that is durable, good length of 40 inches and the ability to also adapt to street hockey and floor hockey.